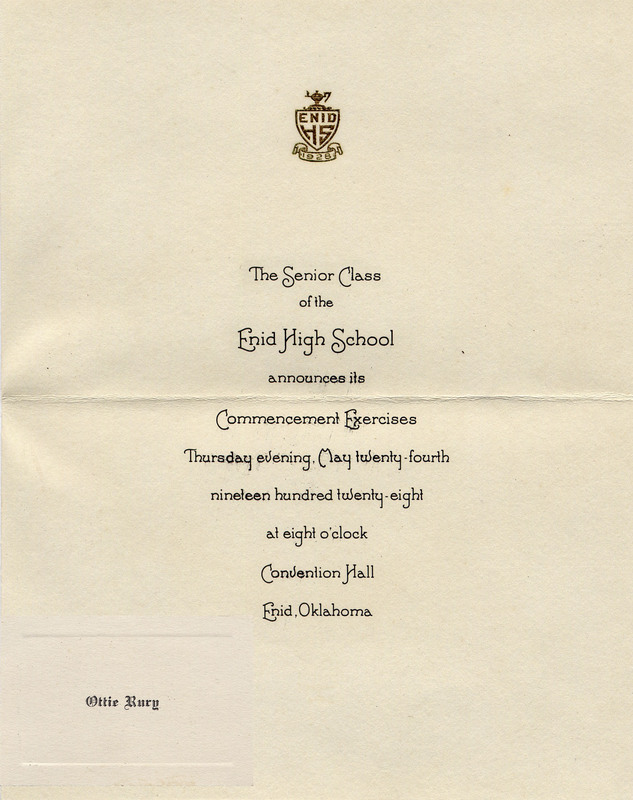 May 24, 1928 my grandmother, Ottie Brown nee Rury, graduated from Enid High School in Enid, Oklahoma. She worked hard for it. 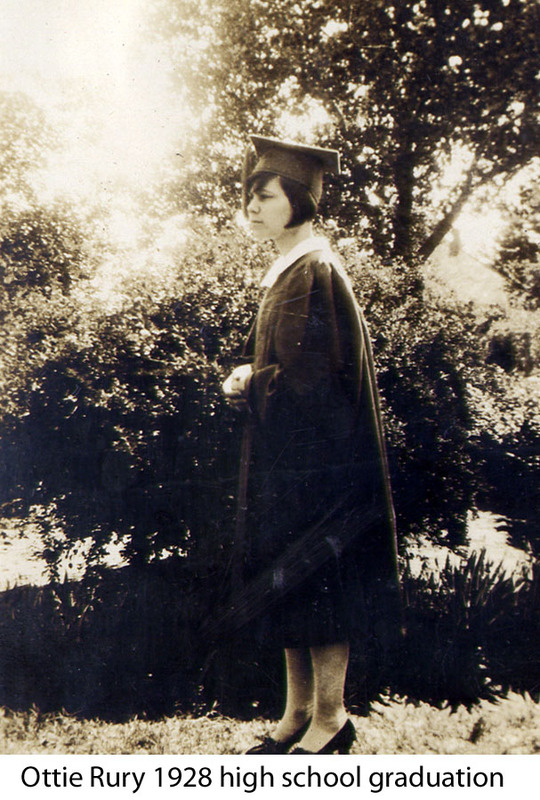 By 1925 she had arranged with the hospital administrator to go to nursing school when she graduated from high school, which was scheduled to be in 1926 just shy of her 18th birthday. However, on November 3, 1925 her father, James Rury, died. Ottie was the oldest child and she quit school and went to work in order to help support her family. After a year and half of working at Woolworths she changed jobs and went to work for the telephone company; there, she had split hours and was able to work 8 hours a day and go to school 4. Ottie kept her report cards and they show that in the school year before her father died her grades were very good and she had zero absences. When she went back to school while she worked her grades were still very good but her absences ranged from 33 to 78 times each semester. Finishing school must have been a trial for her but she accomplished it in 1928. I feel extremely honored that Grandma gave me her high school ring. I keep it on display in my curio cabinet of important family keepsakes. Ottie’s education didn’t stop with high school, she graduated again 33 years later. In 1959 she began nursing school and attended 3 days a week for 18 months. 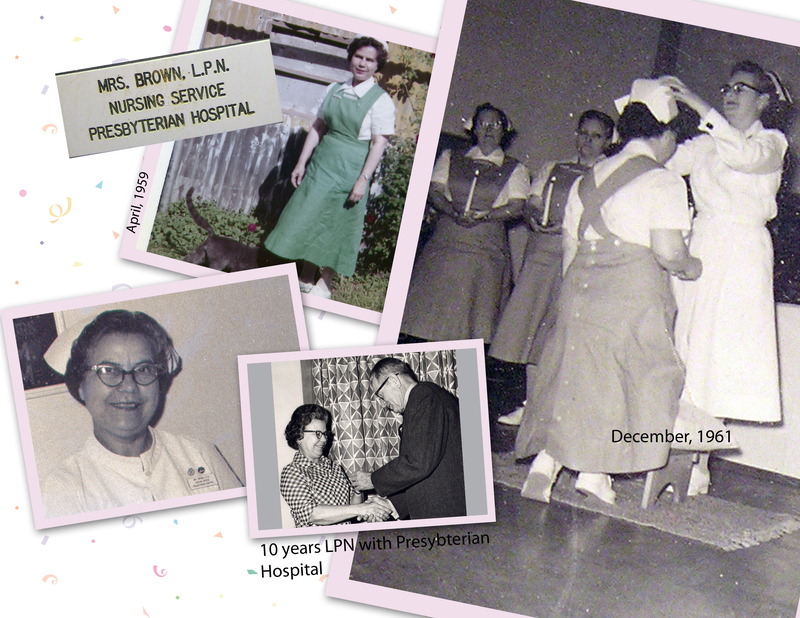 In 1961 she graduated in the third class of LPN school at Presbyterian Hospital in Oklahoma City. She worked as a nurse at Presbyterian until she retired. Now, I celebrate my Grandmother’s 81st high school anniversary and her accomplishment in becoming a nurse. To hear Ottie tell her own story, watch this video in which she talks about her second opportunity to become a nurse. I have always felt extremely honored to have had Mom and Dad as parents. And now I feel so blessed to have you as my niece. I can’t begin to tell you how much I appreciate all your work on this enormous project. Its almost like having Mom back again. This makes me feel really good. I’m so glad you read it. I didn’t remember when Grandma retired. Was it soon after they moved to NW 30th about 1973? Also, there’s a photo (I’ll put it on flickr) that has Grandma and what looks like Aunt Jessie both in graduation gowns. Did they graduate from high school together? Jessie would have been 18 in 1928. What a wonderful treasure you have, Kay, in that precious video of your grandmother. As I listened to her I felt I was sharing her with you. I remembered my grandmothers and my aunts and uncles and wished I had been fortunate enough to record their voices, even better would have been their faces! Grandma was 85 when she did the video. She had a camcorder in her dining room and would press play and talk about her life. The entire video is over an hour long and is quite a treasure for us. Curtis, I’ll get you the entire video. Every time I watch the video it makes me feel like I could pick up the phone or go to her house and visit. At the same time I realize those aren’t options anymore. No one is really ever ready to say goodbye, no goodbye is ever really enough. It’s great to hear from you!